At the Ten’ (‘Shadow’) puppet theater in Moscow, audiences can watch plays in miniature or choose a Shakespeare play to be performed in a chest of drawers. For those who prefer to stay at home, the theater offers to bring opera performances to your door by ‘ambulance’. RBTH found out more about the unusual projects created by the theater’s organizers. The Moscow-based puppet theater Ten’ (‘Shadow’) is one of the most creative of its kind in Russia, if not the world. Founded in 1988, it was originally a private family theater organized by artist Ilya Epelbaum and actress Maya Krasnopolskaya. Later, the Moscow city administration allocated a building for it and it became a municipal establishment. One of the distinctive features of the Ten’ theater is the quirky and original projects it organizes. These vary from performances of Shakespeare plays to order as part of the CookCafe project, to ballet and opera shows involving a miniature cast of ‘Lilikans’, to touring opera productions in the ‘Theater Ambulance’. Here is a short guide to three of these unusual theatrical initiatives. This is the most unusual theater project in Moscow. Unlike a real ambulance, the ‘theater ambulance’ does not arrive immediately. Once you have placed an order, you will have to wait a few days. Then a Mercedes minibus with a theater in it will turn up at your place, and you will see an opera performed by puppets in a vehicle parked outside your house. The “theatermobil”, as the actors call their minibus, does look like an ambulance from the outside. Inside, there a small stage for tiny puppets, an orchestra pit and an audience hall for just three people. During a 50-minute performance, you will get to see five classical operas, lasting 10 minutes each. “This is a project of ours, an evening of operas in an abridged version,” says Anastasia Demikhovskaya, an actress and administrator at the Ten’ theater. “These are proper operas, with the plot, characters and the main arias retained. Our repertoire includes Madame Butterfly, Carmen, Eugene Onegin, Ivan Susanin, and even an operetta, Silva. The idea of a touring theater has been around since the Middle Ages. “Given our climate, a minibus is the best option. We can perform in any weather: In winter we have the heating on and in summer, the air conditioning,” Ilya Epelbaum, the artistic director of the theater, told the Teatral website. The full name of another Ten’ project is ‘The Big Lilikan Royal Academic National Theater of Drama, Opera, and Ballet’. It all began with a show called ‘Lilikan Royal Theater Tour’ that Epelbaum and Krasnopolskaya invented in the 1990s. Lilikans are tiny creatures, even smaller than Lilliputs. They live on a remote island called Milikar. Their main art form is the theater. Lilikans spend all their time watching opera and ballet. The Lilikan Theater is a model that is on permanent display at the Ten’ theater. It has a stage, an orchestra pit, stalls and boxes. 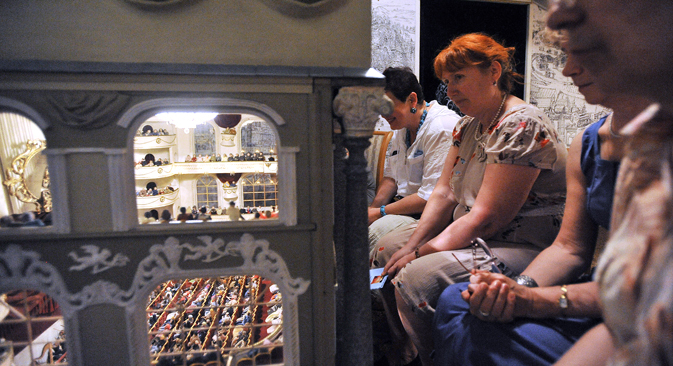 There are toy Lilikan musicians in the orchestra pit and toy Lilikan spectators in the audience. While human spectators can watch Lilikan shows through the windows in the model with binoculars. All the shows are performed by tiny puppets, but there is one ballet, Polypheme’s Death, which features a human performer, former Bolshoi star Nikolay Tsiskaridze. Since he is too big to fit on the Lilikan Theater stage, all that is seen of him on stage are his feet and ankles. In addition to ballet, the theater performs plays by Molière and Tonino Guerra, an evening of operas, which became the basis for the Theater Ambulance project, and several fairy tales. Another project by this unusual theater is called CookCafe. In one of the rooms in the theater building there is a large carved chest of drawers. Inside it is a stage for puppets. In front of the chest of drawers there are five tables, for three people each. In between the plays, food is served to all the tables. Each of them gets a menu listing Shakespeare’s plays. Each table can select one play. Thus, every evening five plays, each lasting 10 minutes, are performed and no one knows in advance which five it will be. “Ideally, the menu should contain all of Shakespeare’s plays, however, so far we have prepared only 10. The rest are still in rehearsal. Despite the fact that each play lasts only 10 minutes, they take as long to prepare as full-scale productions,” says theater director Maya Krasnopolskaya. Tickets to CookCafe can be booked on the theater’s website, however, since there are so few seats available, there is a waiting list. “Usually, when people book tickets to CookCafe, we write back to them, telling them to forget about it for a while. So when a couple of months later, they hear from us that they are the next on the list, it comes as a pleasant surprise to them,” says Anastasia Demikhovskaya. Ticket prices vary. For example, a table for three for the CookCafe project costs 6,000 rubles (about $125). The theater is currently based at 5 Oktyabrskaya St., not far from the Mendeleyevskaya and Dostoyevskaya metro stations.